We're in a temporary home for the month of January (new year, new floors! ), and in the process of moving alllllll our merchandise two doors down the street, we discovered some very special orphans toys just begging for homes. So we thought: who are we to get in the way of a toy just begging to be played with? Out with the red pen! We've slish-slashed the prices on a few treasured Fiddlesticks toys, and we're hoping they'll be just the thing you're looking for. See something you like? Give us a call, and we'll set it aside for ya! 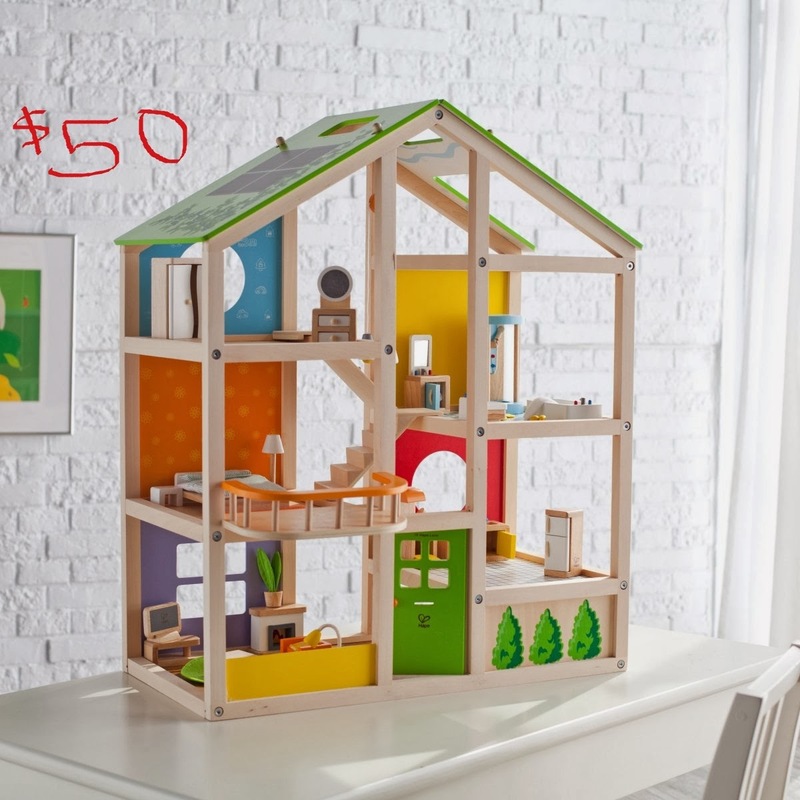 Would we sell a dollhouse in San Francisco that didn't boast solar panels? No way! 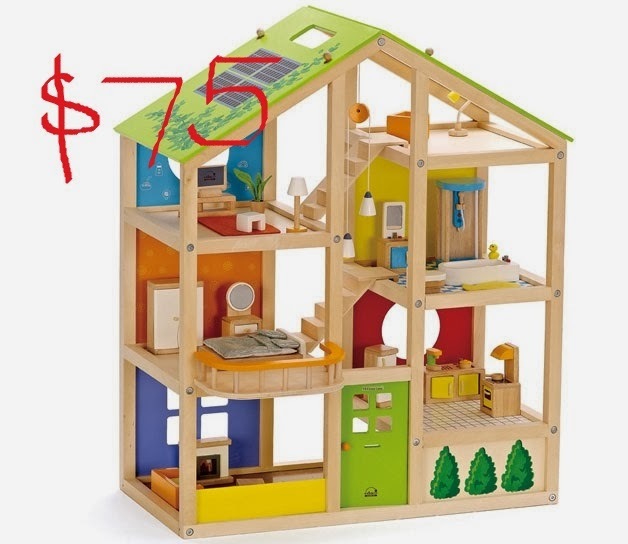 This All-Season Wooden Dollhouse by stellar toy company Hape includes four room sets: Master Bedroom, Family Bedroom, Media Room, and Kitchen. It comes fully furnished, and is easy to assemble. Materials include baltic birch, maple, and rubberwood. Ideal for ages 3+. Need a dollhouse for a slightly older crowd? Need an activity to fill a whole slew of rainy afternoons? These beautiful houses (produced by hand from recycled materials in Chicago, IL) arrive packaged flat. First, don your architect hat and follow the instructions to construct the house (parents might need to help). Then, put on your interior designer hat and get to work! Use the colored paper and other included props to put up pictures, hang curtains, lay out a rug - you get the idea. Then, let the playing begin - one little pony-tailed girl (and her pet hedgehog) already reside at the Logan House, and you can add more! The front of each house is made from baltic birch, and the remaining walls are made form sturdy, recycled cardboard. Each house kit comes with all house components, a DIY design ideas book, a DIY trading card, and more! On your mark, get set, go! The Hape Switchback Racetrack Toy is perfect for the speediest of toddlers. The colorful, double-wide racing ramp track allows 1 or 2 cars to go racing down to the finish line. 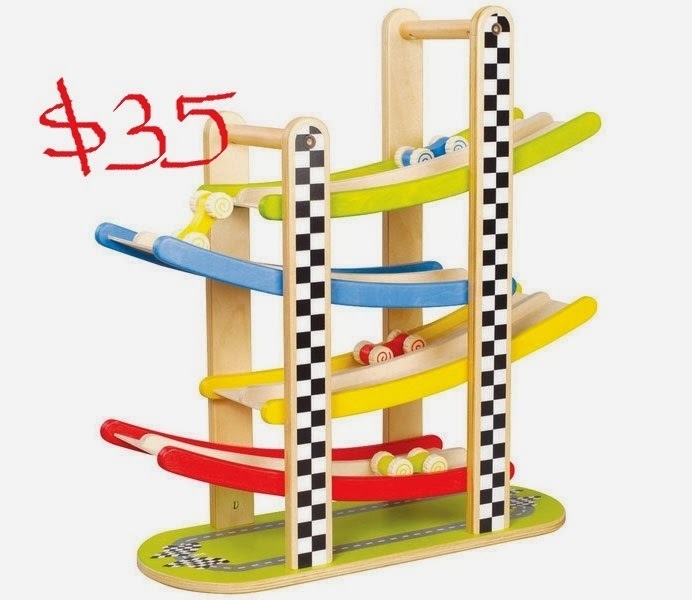 A wonderful vehicle pretend play set, this racing toy includes 4 wooden vehicles - back and forth they go! The Educo Switchback Racetrack Toy is a great way to get imaginations racing as these cars fly down the track for a speedy finish! All wooden parts. Measures approximately 8.5"x7.5"x21"